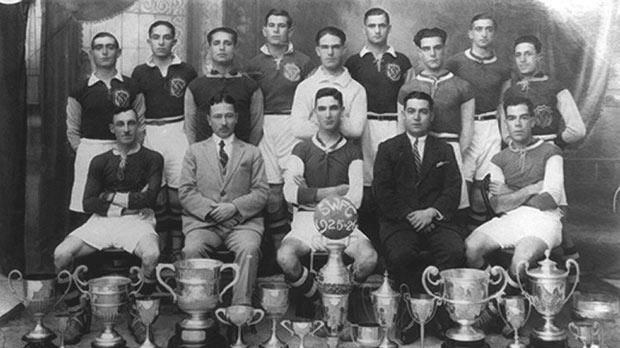 Sliema Wanderers, winners of the league championship and Cousis Shield in 1925-26. In 1925-26 Sliema Wanderers had a great season. It is true that they lost 2-1 to the Dorsetshire Regiment team in the Cassar Cup but they made up for that by winning the championship and Cousis Shield. The championship that season was one of the most exciting in the era of the Empire Sports Ground. Interest was maintained up to the last match when Sliema beat rivals Floriana 4-1. The star of the show that day was Frankie Busuttil who scored a hat-trick. The duel between Sliema and Floriana was extended to the Cousis Shield which, in those days, was the equivalent of the FA Trophy. The competition kicked off on April 11, 1926 with the match between Floriana and Valletta United. The Greens won this game 2-0 with both goals coming from Ċensu Vella. On May 2, the Wanderers beat St George’s with the same scoreline. Ġużi Pisani and Teddy Holland were the Blues’ scorers. The following Sunday, Sliema Rangers beat Msida Rovers 4-2 in the last match of the first round. Cottonera FC were awarded a bye. The first semi-final was played on May 13, between Floriana and Cottonera FC. It finished one-all but after the game, for unknown reasons, the MFA decided to suspend the competition and continue at the start of the following season. The decision brought a number of protests from the clubs and public. Was this decision taken because Floriana had a weak team and risked being eliminated? We cannot really say, but I’m pretty sure that we are not very much off the mark. The replay was played on November 28, 1926. The Greens won easily by three goals to nil with goals from Hunt, Alamango and Cauchi. Sliema Wanderers should have played against Sliema Rangers on November 21 but the latter preferred to lose their £10 deposit rather than play. The Wanderers were given a walkover. So, on December 8, Sliema and Floriana faced each other once again in the Cousis Shield final. The Wanderers went close to taking the lead very early in the match when on six minutes a free-kick from the edge of the area was well saved by Floriana goalkeeper Azzopardi. Two minutes later, Alex Calleja narrowly missed the target for Sliema but Floriana produced a series of attacks which brought the best out of Sliema goalkeeper Joe Nicholl. The ball travelled from one penalty area to the other as each team tried in vain to open the scoring. Both teams had their chances but Floriana could have settled the issue in their favour before the half-time break. In the second period, play was evenly divided and both goalkeepers were kept busy. However, no goals were scored and the game had to go to extra-time. Then, Busuttil scored for the Wanderers. The Greens were rattled. They tried hard to draw level but the Blues were determined not to relinquish their lead. The final whistle was greeted with a huge roar from the Wanderers’ supporters. That evening, there was a great feast in the town as the Blues celebrated another victory over their sporting foes.